Red Pepper Quilts: Stripes Galore! 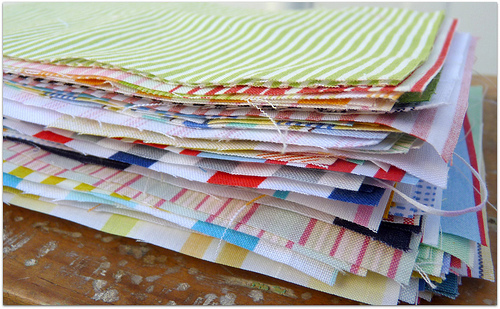 This bundle of fabric, as seen in Sunday Stash #90, was always destined to become a quilt, sooner rather than later. I already had a mental picture of the quilt design/layout, and with a quick change of blade, the rotary cutter whizzed through the fabrics, cutting rectangles according to the original plan as well as setting aside an extra set of squares to be sewn together into a quick and simple quilt top at a later stage. What happened next? I really wanted to see the effect of the layout of the extra squares of fabric that had been cut, and impatiently found myself arranging and rearranging the squares on my design floor, and then ..... went on to sew the complete quilt top. 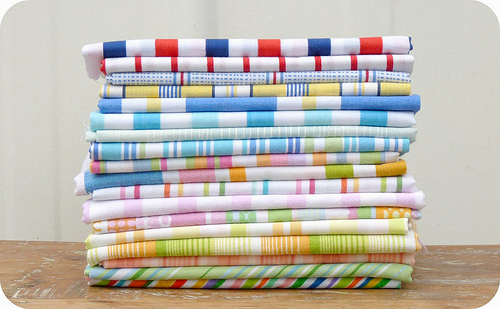 The fabrics used for this quilt are all stripes ~ some new and from stash (all 100% cotton), others are reclaimed vintage bed linens (meticulously washed) which are either cotton or a polycotton blend. The recycled bed linens were all in very good condition and easy to work with. At the last moment ~ which always seems to coincide with the wee hours of the morning ~ I decided to add some fun borders. The borders are easy piecing Half Square Triangles set off with some Robert Kaufman Kona - Ash. I am really pleased with the colorful effect of the layout and cannot wait to start quilting this quilt top to add yet another dimension to this quilt. I love it. Of course, I always love your quilts, but the basket weave effect on this one is so fun! Effect? Affect? I can never remember which is right...sorry. What a fun quilt, the half square triangles feel kind of nautical - like nautical flags. Were there any stripes that you pulled out because they didn't work? Or did everything fit? I was just going to say what Anita up there did! There's some combination of the fresh colors, stripes, and the triangles that make this quilt feel very nautical, without feeling like it screams "Hey, I'm nautical!" It makes it a great thing to have for the beach house on still-chilly Spring and Autumn nights! Very nice, love it. Are the borders asymetrical or is that just how it looks in the picture? I agree with the above comments that it gives a very nautical theme. I love the stripes. Thanks for sharing! You have so much inexhaustable energy! I remember when I first started quilting... WAY back when...we were told NO plaids, NO strips...OH, how things have changed.... YEP..
changed for the... better...YEP for the WAY BETTER! 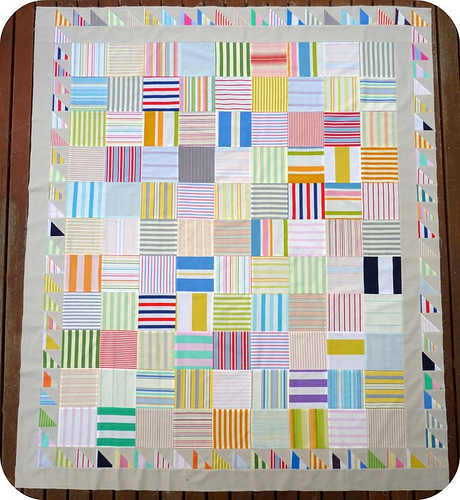 LUV your quilt with the stipes... LUV IT! Everyday I check your blog and you always amaze me with how fast you work. I can hardly finish a quilt every three months. It doesn't help that I my first priority is my 2 year old son though. Looking forward to the crinkle effect of your quilting and the design you choose. I like it a lot. Excited to see how the quilting rolls along, too. Good job, gorgeous flimsy. You have such great vision. It really turned out well. It looks lovely! I like the way the stripes run into each other. The HST make a fantastic border! Love that nautical thing - its all ship shape and Bristol fashion - as the saying goes! So easy and yet so effective! I love the triangle border. It definitely gives the quilt that extra zing. Love it! 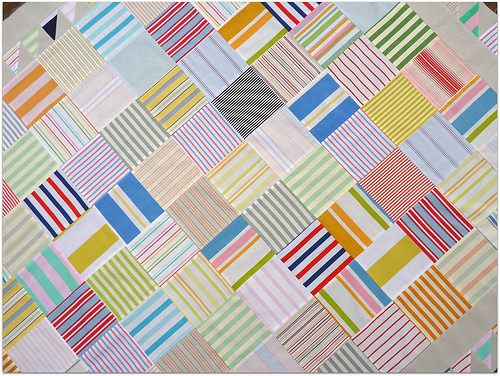 This makes me want to do a stripe quilt. This one is so nice. I wish I had this many scraps with white in them. Your quilts are so nice. I hope this one is a pattern too! these stripes are FANTASTIC! i feel like it's hard to find good stripes out there and you've collected quite a stash. 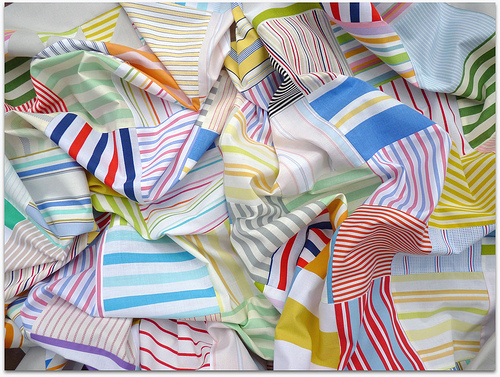 i *think* i recognize that red/blue/white stripe as a vintage sheet perhaps? - my parents had sheets just like that! nice work, so cheerful! Very nautical! It was nautical even before you added the HST's, but with them as "flags" it's definitely a quilt for a summer home! I LOVE this quilt! What a great use of stripes. I never would have thought about the layout for these stripes. It turned out amazing. Very pretty. Love it. Love the effect of the mini HSTs on the outside. Wow, it almost looks neon! Very nice! I love that the HSTs are all facing the same way, little flags moving in the breeze! RITA!! As always, it's gorgeous!! !